Dev Blog #13 – New Olivia and More! We had to shift our schedule because of ESGS, so for today’s dev update we have three weeks worth of progress to show. 1. We listened to the feedback we received from Discord and changed the portrait art for Olivia, who now looks like a more privateer, pirate-y character. The backstory is that she was in the military force but got kicked out. 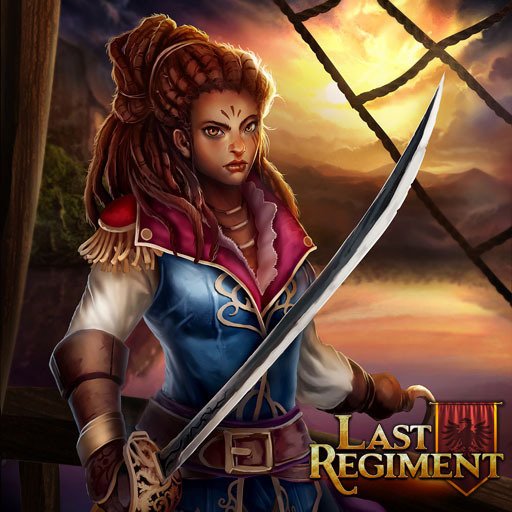 While on exile in the Ruman islands between Kothia and Portella, where she is originally from, she developed a badass crew of swashbucklers and pirates. Note that this isn’t the final art yet, and we’re still considering making more changes. 2. We added some functionality to the main menu so that now when we switch from mode to mode, the options, information, and art would change. 3. We are making the map editor more up-to-date. Right now it’s not yet as user-friendly and still very much a dev tool, but it remains to be a planned feature for release. 4. 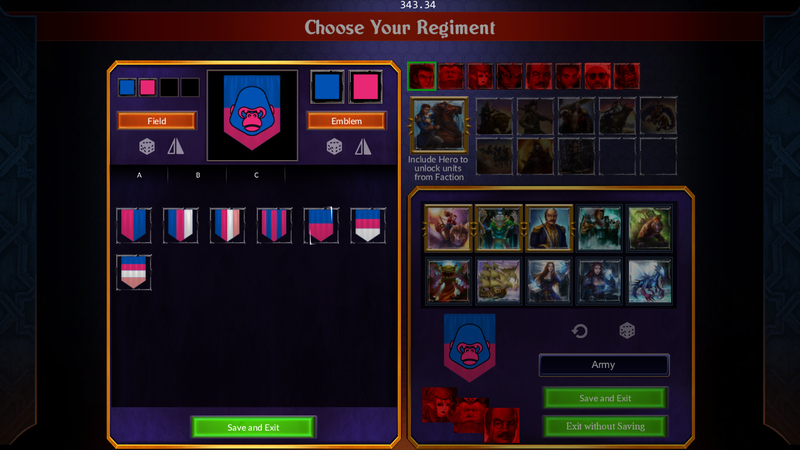 We’ve updated the Choose Your Regiment screen and added the option of creating emblems per regiment, which are like alternate decks that you can use depending on the map. It’s largely based from the emblem system from Legends of Callasia, and there are different themes separated into tabs with up to four different colors that you can use for the background. We’re no longer adding flags as a background option since that piece of reality pulls you out of the whole fantasy feel (although you can make it thematically similar). 5. 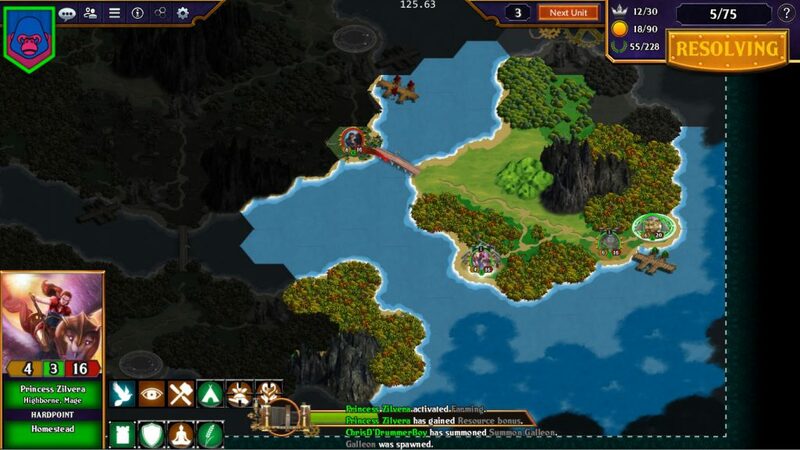 The map edges are now a lot wider than they’re supposed to be, because previously some of the UI would get in the way. 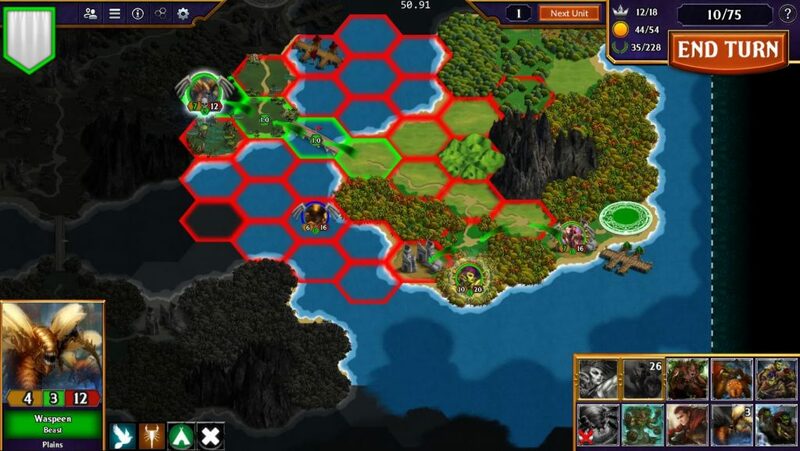 Now when you select a unit or hex, the UI would not intrude much of the game. We also revamped the power and summon system wherein you can view their descriptions using mouse-hold, then play them on the map via drag-and-drop, similar to how cards are played in Legends of Callasia. 6. The selected object panel was also revamped, with a clear separation of what the unit can do (top) and what the current territory allows him to do (bottom). There are also different shapes to indicate if they are passive or active abilities. 7. The fog of war no longer has the cross-hatch lines and now looking better, but we still need to make the edges look more organic. 8. 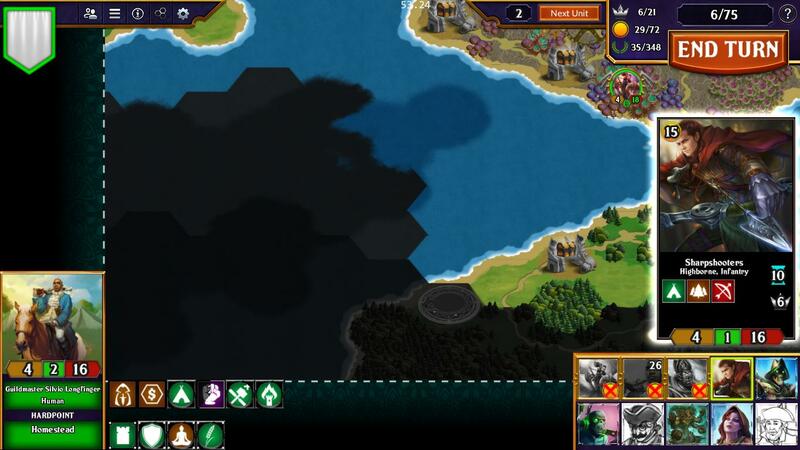 We’ve been playing around with the water: now we have deep and shallow water tiles. 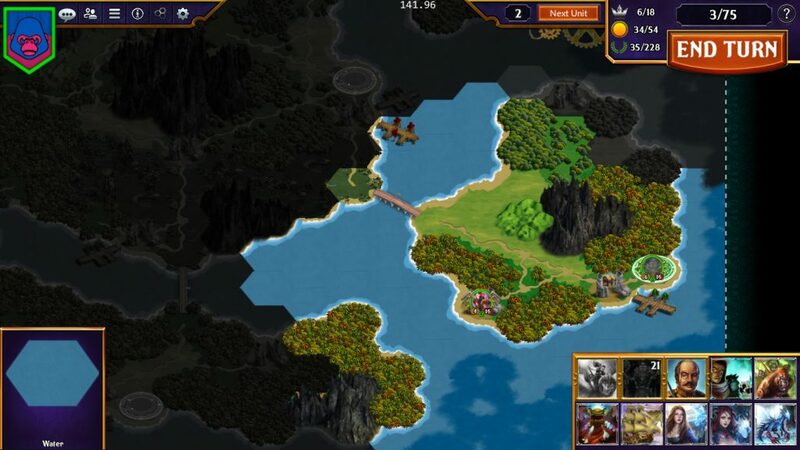 We spent some times making the coastlines look clearer and more interesting, but we’re also considering to have make it a game effect such as units that can or cannot go there. 9. Another slight modification we made is on the movement arrows. They look cleaner, don’t sit on top of the meeple anymore, and no longer have placeholder programming numbers. Now as you drag the unit, you can see how many moves it’s burning. 10. 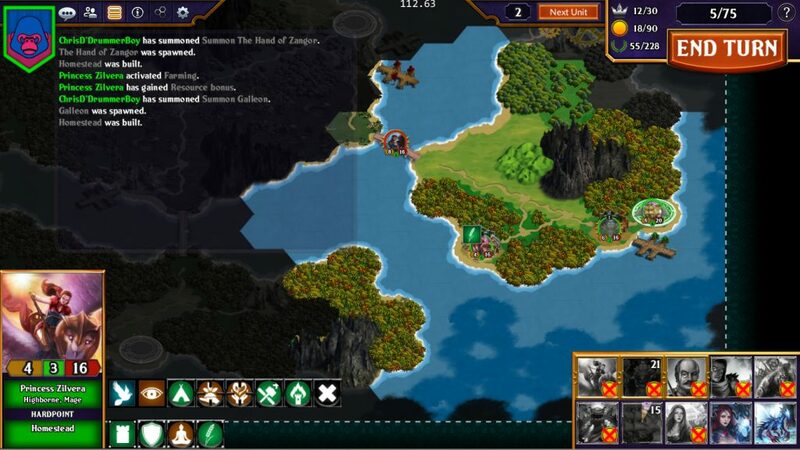 We’ve added 8-players maps and they’re a lot of fun. It’s a little bit slower because resolution takes a bit longer but still pretty snappy. 11. We’ve added a game logs feature which would appear in two places: at the bottom of the screen as it happens, and a history which you can collapse from the upper left panel. We’re still playing around on how we want it to look. 12. We’ve added cone effect damage that would allow you to target something that’s not in a round range, which would give us more interesting options in our spells. We haven’t made any units yet with that type of damage, so maybe in the next livestream we’ll have some to show. It’s going to be busy in the next few days because of ESGS, and hopefully we’ll still be able to get a lot of stuff done for the next update (most likely because of various feedback we will be getting).